When a leading UK civil engineering contractor became involved in the manufacture of bespoke access steps and ramps a major problem the company faced was how to ensure the steps and ramps had a non-slip surface. 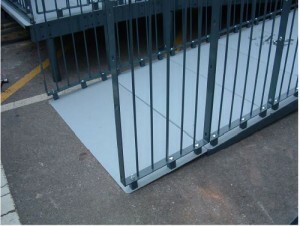 The problem was enhanced because the galvanised steps and ramps were mainly used in external situations where there was a high volume of pedestrian traffic. Consequently, they became slippery during wet or icy weather. Initially, anti-slip paint was used but this proved to offer only a temporary solution. The company then contacted Porcher Abrasive Coatings to see if there was any way that the abrasive coating on their TreadSafe® stainless steel product range could be used in conjunction with the access steps and ramps to provide a non-slip surface. Porcher Abrasives already had several years’ experience in coating customers’ existing metal steps and ramps, particularly those used in public access areas. 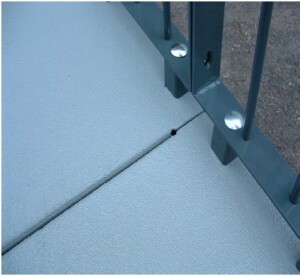 The first installation of the access steps with the abrasive coating was in February 2003 at a Peterborough hospital. Since then, further access steps and ramps with the specialist non-slip coating have been installed at a Kettering-based Doctors Surgery and a Job Centre in Slough. As well as coping with high volumes of pedestrian traffic, these ramps and steps are also subjected to use by pushchairs and wheelchairs. It is the civil engineering contractor’s view that the Porcher Abrasives anti-slip coating has proved to be the ideal solution to the slip problem they faced with their metal steps and ramps. Many of their ramps are designed specifically for disabled access so it is even more important that the surface is non-slip.